Screen-grab of Lt. Gen. Jay Silveria from the USAF video. 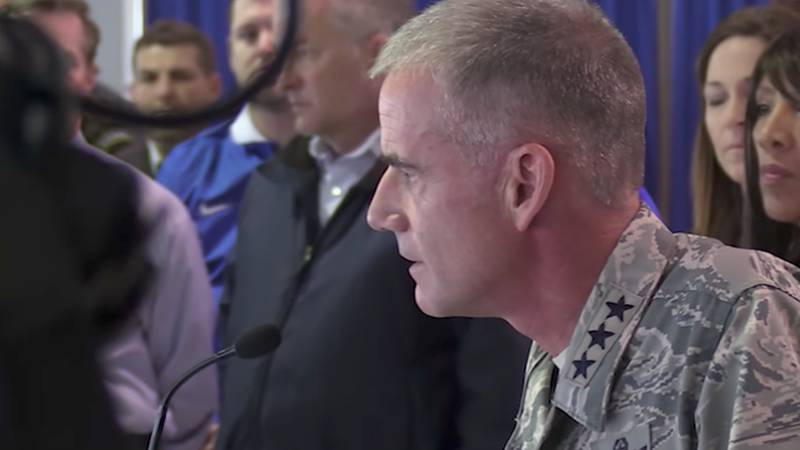 A video of Lt. Gen. Jay Silveria, superintendent of the Air Force Academy, went viral after he spoke to 4,000 cadets in response to racial slurs found written at the AFA preparatory school. Silveria, a 1985 graduate of the academy, was announced to be superintendent of the academy by Defense Secretary James Mattis on May 17. He grew up in an Air Force family, per his Air Force bio. He was Vice Commander at Afghanistan's Bagram Air Base. He has logged more than 3,900 flight hours in the T-37, T-38, F-15C/E, HH-60 and F-35A aircraft, as stated in his bio. He was previously the Deputy Commander of USAF Central Command, and Deputy Commander of Combined Air Force Air Component, Southwest Asia. Silveria received "the Pentagon's highest award for service outside combat, the Distinguished Service Medal," according to the Colorado Springs Gazette. He also received the Bronze Star. He was named a senior executive fellow at Harvard in 2009.